1. One day the mother-in-law of a Santal bridegroom cooked a special dish for him when he visited her. 2. "This curry is delicious. What is it?" The mother-in-law pointed at the bamboo door. 4. So he removed the bamboo door and left for his home carrying it with him. 5. On reaching his village, he told his wife, "Make curry with this bamboo door." 6. She was shocked. "How can I make curry out of a bamboo door?" she said. 8. His wife boiled it and boiled it. Later when her husband tasted it he said, "It's too hard to eat. You don't know how to cook." 9. His wife added more water and boiled it and boiled it. But it was still so hard that it couldn't be eaten. 10. The in-laws came to visit the young couple that evening. They listened about the curry and laughed at his foolishness. The mother-in-law said, "Didn't you know the curry was made from bamboo shoot and not from a bamboo door?" (a) What did the young man tell his wife on reaching home ? (b) Why was his wife shocked? 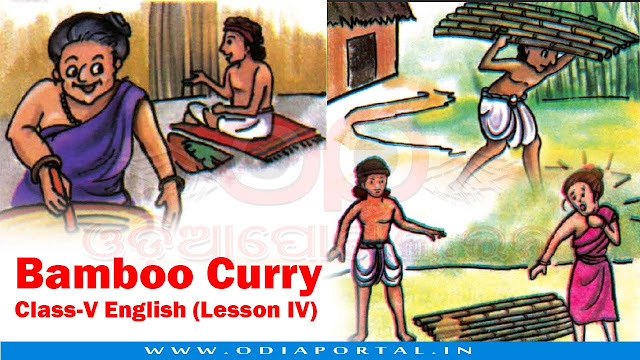 ( c) How did the young man help her in making the curry? ( d) Why did the young man say that she didn't know how to cook? ( e) What did she do to boil it further? ( f) Who came to visit them in the evening? (g) Why did they laugh at the young man? (h) How is bamboo curry made?